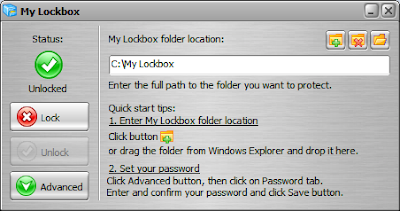 My LockBox installer will ask for your password and folder location at the end of the installation. You should use an easy to remember password because once forgotten then you may say goodbye to your private folder. - To lock a folder, open My LockBox from Start menu. Then on My LockBox, enter the folder location (if you haven't selected it during the installation) then click "Lock" button to start the protection. - To unlock the locked folder, open the application and simply click the "Unlock" button. Download My LockBox via [fryan0911].